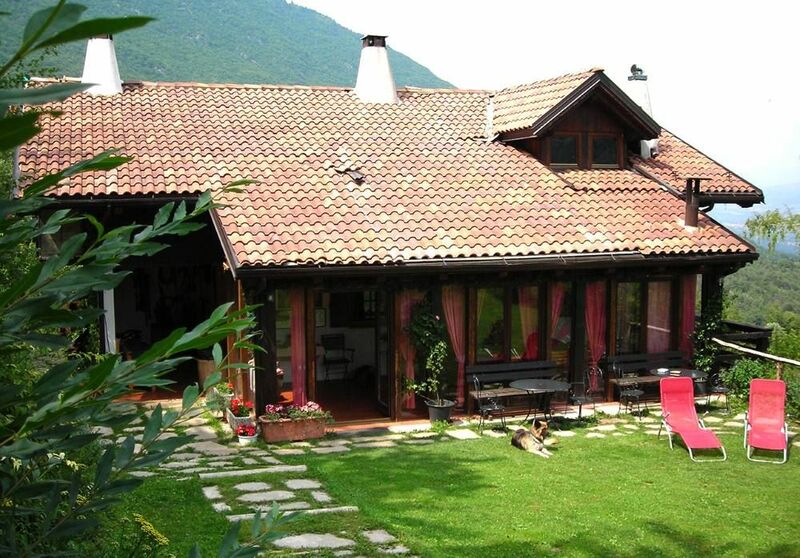 Charming mountain villa situated on the plateau of the Paganella secluded and quiet, with lovely views of Castel Thun, Castel Belfort and the Val di Non, the Valley of the apples, just minutes from Lake Molveno and Lake Tovel. Strategic point for horseback riding, mountain hiking, to follow cultural events (Sounds of the Dolomites), for wine tasting tours, for day visits to famous places such as Lake Garda, Cortina d'Ampezzo, Madonna di Campiglio, Alto-Adige . Ideal to enjoy with your loved ones the simple pleasures of life, slow living, to relax in the sun on the rooftop terrace, cook together in the barbecue area, devote themselves to the cultivation of vegetables and gardening. Recommended environment for guests that respect the environment, nature, ownership. Possibility to rent monthly or even yearly. We stayed in this lovely property for just over a week in July 18. The location is perfect - down a paved lane away from it all (about 5 minutes drive from the village!) but with fantastic views. The garden is exceptional - lots of flowers and places to sit/eat in either shade or sun. We loved being woken up by the hum of the bees - and very little other noise. Perfect! The house has 4 large bedrooms, the two on the lower floor have en-suites with showers, the two upstairs (top floor) share a bathroom with shower and bath. Bedrooms and bathrooms are well appointed. Lots of space both inside and out - 'cozy' is a misnomer, the house is large. The only things to watch out for are the stairs, both sets are 'tricky' and it is dark inside the house. However this was not a concern as we were there in the summer and we took all of our meals outside. There is a large, light conservatory with a big table and sitting area if the weather were to be poor. The kitchen is well appointed, the house had everything required for a family holiday - except perhaps wifi but the phone signal is 4G so not a problem - including a table tennis table, BBQ, TV and DVD player; and two hens, various cats including 2 kittens and a horse! The owners were lovely and were very helpful - we took up two of their recommendations for restaurants, and a concert in the mountains, all of which were great. I can't say enough how wonderful this location is - if you want a quiet, relaxing and beautiful place with outstanding views this is the location for you. Also nearby towns of Andalo and Molveno, plus all the walking in the mountains, ensure there is plenty going on. Great place, thoroughly recommend with the small caveat about the stairs. We rented this house for one week in September. For part of the time we had 4 couples staying. Each bedroom has a nice bathroom (4 in total). The house is decorated nicely and comes furnished with everything needed. The terrace in the back provided a daily sun filled area for relaxing with a spectacular view. The owner, Bruno, and his family were so welcoming and available for anything we needed. They even arranged for a cooking class at the house which was amazing. The house is in a fairly remote area but easy to get to by car. As described, it offers a nature/farm like environment. We ate figs off the trees, squash from the garden, fresh picked mushrooms and peaches. The house could be difficult for someone with mobility issues. We would highly recommend this VRBO home! Dei proprietari gentilissimi e accoglientissimi. Casa veramente ottima in un posto molto rilassante e piacevole. Un soggiorno di cui ci ricorderemo ! We were two families (4+4) and enjoyed our stay very much. The house is about 5 minutes away from Cavedago, far from everything and everybody - a very beautiful location with a wonderful view. The house is a bit rustic but built with excellent taste and in a very good condition. It offers everything that people looking for some separation from the crowds may need. If it was possible I would rate it 4,5 stars but since it is now allowed it is rather 5 than 4. Positive: big house with modern rooms, beautiful garden, enough space for 8 people together in at least 3 different places in- or outside, many things to see within short drives (we made it a ritual to start the day with a coffee in the Cafe Bellavista). For us it was good that the house has no wi-fi, others may see this differently. Negative: I hope the brand new dish-washer has been properly installed in the meantime, we had many problems with it. The rooms in the bottom floor were really cold at night. The road to the house is for one car only and we ran on a rock which was fully covered by grass when we let another car pass by, fortunately no damage was made despite the horrific scratching noises we heard. Given the location where the chalet is located in a short time you can visit the Christmas markets and in Trentino South Tyrol, as well as that in the lovely little village of Ranzo, one of the most beautiful villages in Italy.